These were the words said by a father aged 70+ to his 40+ son on the school grounds of St.Pauls. 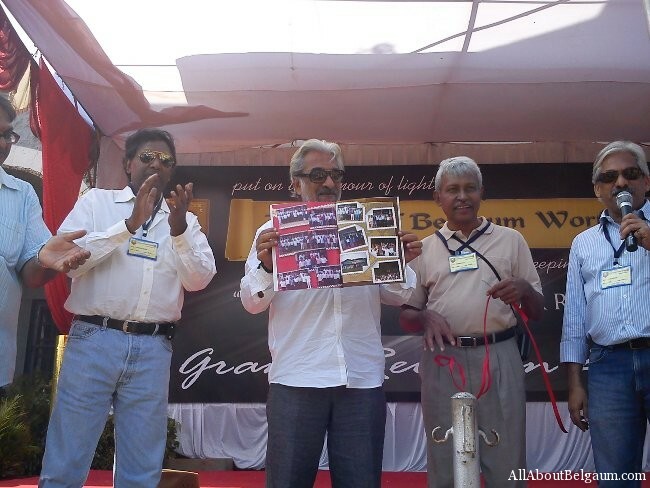 Paulites of Belgaum worldwide a alumni association of St.Paul’s had organized a grand reunion of all the batches on its school ground on the 4th and 5th of December. More than 1000 Paulites (students passed from the school) had gathered for the reunion. Right from the 1947 batch to the latest 2010 batch all had their presence. Tony Machado who had passed out of school in 1947 had come to this school after 60 long years and he said there is nothing like coming back to school. The now parents showed their spouses and kids the classroom they studied and what all they did when in school. A kid told this blog that it was nice to hear that even my dad was naughty in school and even he used to climb trees and eat tamarinds. People had come in from various parts of the globe just to attend this reunion and they said they relived and will cherish each and every moment spent. Old friends met after decades and all tried to relive those nostalgic moments by visiting their classes and meeting their teachers. A gala entertainment function was held in the evening in which Paulites who have scaled great heights were also honored which included Vent Cuthino Ex-VC Gulburga university, Dr.Arun Bali, Dr.Mahadev Dixit Cardiologist, MLA Feroz Sait, Fr.Peter Machado. A souvenir was released on the occasion. Feel proud to be among my life’s best friends again! LOL… That was a good read CSN!!! wen we tlk about st pauls first thing we recall is our neighbors….OH i m 85 batch april passed first attempt….though i was assured tht i will be failed even if i pass…usually the under table sys says i will pass u even if u fail…..back to our neighbors….PT store room was fav for all coz we could get better view and closer view as the long jump pit was close by…taller ones dint bother as view was clear but shorter ones had to do bit of jumpin…..
Oh sorry i dint mention abt studies as we had too much of extra curicular activities….we had match up to the camp high street boys…and thnks to gawali ali OLD MONK never had so cheap anywer…..
no colas can beat the heat like ali and ghafur bhai…their flavours and remember the tricks ghafur used to attract more female crowd to his gaadi…. oki back to school enough of goin around the neighbors. in school..wht i did ….udid….we all did….let it be within school….